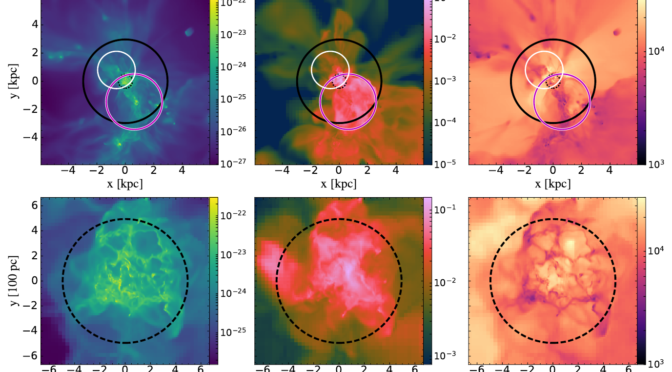 This week submitted a paper (arXiv) that compares, validates, and calibrates semi-analytic models of high-redshift galaxy formation to our previous simulations of the first stars and galaxies. This paper was led by Benoit Côté, a postdoc at the Research Centre for Astronomy and Earth Sciences in Budapest. Semi-analytic models of galaxy formation are a great, computation-lite method to explore which physical processes are important during galaxy formation. Here we compared the most massive galaxy in the “Birth of Galaxy” simulations to GAMMA. We determined the best model that accurately tracks the amount of gas transferred from the star-forming regions to the circumgalactic medium (CGM). This gas lifecycle is a key component to understand how galaxies form, and we found it to be much more rapid during the initial assembly of galaxies. In particular, supernova eject creates a inhomogeneous distribution of metals that is well captured by imposing a spread of 0.2 dex in metallicities in the semi-analytic models. This adjustment results in a good match in the metallicity distribution function of stars in dwarf galaxies, which is a key indicator of the assembly history of the smallest building blocks of the galaxies we see around us.